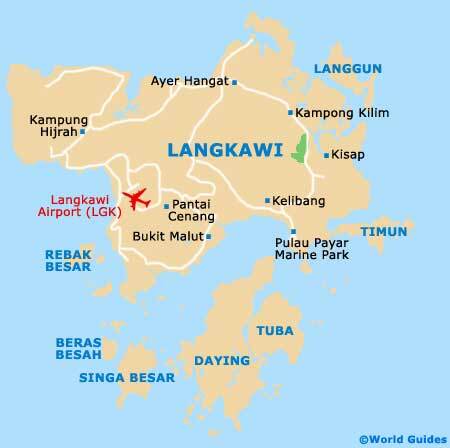 Langkawi doesn't have the choice or quality of produce as mainland Malaysia, yet there are plenty of restaurants and you need never go hungry. Westerners are mainly catered for in the resorts and hotels, meaning that local foods are generally in the minority and not so good. If you want to sample true Malay food, head for the street markets of Kuah Town, where some of the tastiest food can be had. There is also fine dining here, and seafood eateries are ubiquitous to Langkawi. Most visitors dine at their hotel restaurant, or along one of the main beaches. All big resorts have their own eateries, a major source of income for them. While the food is generally good, albeit mostly aimed at the Western palate, it will work out to be way more expensive (naturally) than dining out. The most popular beaches with dining options are Pantai Cenang (the main one) and Pantai Tengah. They have the best choice, with restaurants fronting the sea and featuring some of the best seafood. At Pantai Kok, the seafront Telaga Harbour Park features a handful of trendy eateries, offering dining with quite a view. Kuah Town has the best choice of local foods and is also the cheapest place to eat in Langkawi. This vibrant town has food markets that set up in the evening at the waterfront, with good Malay and Indian curries and Chinese noodles at a snip. You will also find Western goodies here. Kuah also has standard and high-quality eateries and restaurants, with Malay, Chinese, Thai and Western options. Worth noting, the town is an especially good place for foodies to visit during festival time. The Langkawi Food and Fruit Fiesta in June is nothing short of an extravaganza of food, as is the Langkawi Ramadan Bazaar in August / September.